O Brian, Where Art Thou? It was a dark and stormy night. The heavens had opened, the rain was smashing into the earth with a tremendous fury and there I was, running around a pitch black garden with nothing but a pound shop torch to light my way. Jumping over obstacles such as bicycles, sand pits and flower pots, the adrenaline pumping through my veins was fairly palpable. Mud had caked up my shoes and splattered onto my work trousers. Water cascaded down my forehead into my eyes and my glasses had misted up completely. I could barely see. But I didn't care. I was in pursuit. I was Tommy Lee Jones. But without the cowboy hat. My slimy fugitives weren't going to get away this time. Oh no, they would pay for their insolence, for their effrontery and for embarrassing me. Revenge was to be a dish best served hot. The chase carried on for, oh about 10 minutes after which time my breath become laboured and my heart started to pound through my sodden shirt. It was at that point that I decided that I had rounded up enough escapees for the evening, noticing that the neighbour's curtains were twitching and that I was in fact starting to freeze. So I trudged back up the path, or squelched I should say, having caught 16 of the buggers that had dared to mount an Escape from Alcatraz some months previous. Of course, I had no way of knowing whether this group of Brians were the same Brians that had busted loose. But no matter, after drying off and partaking in a cup of hot cocoa, I was pretty pleased that I decided to give this whole snail harvesting thing another go. Especially since I had also invested in a Tupperware box from said pound shop with a secure lid. There was no way that these Brians were going to storm the bastille this time. So getting back on track with the whole business of foraging snails from your garden, which is a perfectly reasonable thing to do, your humble Helix aspersa or common Brown snail is totally fine for eating. Based upon what I have read online, here is a pictorial guide of what to do should you ever decide to take up the challenge. Firstly you got to catch them. As they are nocturnal creatures, you are obviously going to get best results at night. If it is wet then all the better. Arm yourself with a secure receptacle such as a Tupperware box with lid (holes punched in, not too big mind) in which to collect and store them and a torch. And then go into your back garden. Run around your garden with gay abandon, looking under flower pots, amongst foliage, in dark corners. As you shine your torch down and they aim their spindly antenna upwards, staring at you with those cold, black pin sized eyes of theirs, feel free to say something like "the game is up punk". Keep in mind though that anything smaller than 1 inch long isn't really worth your time. 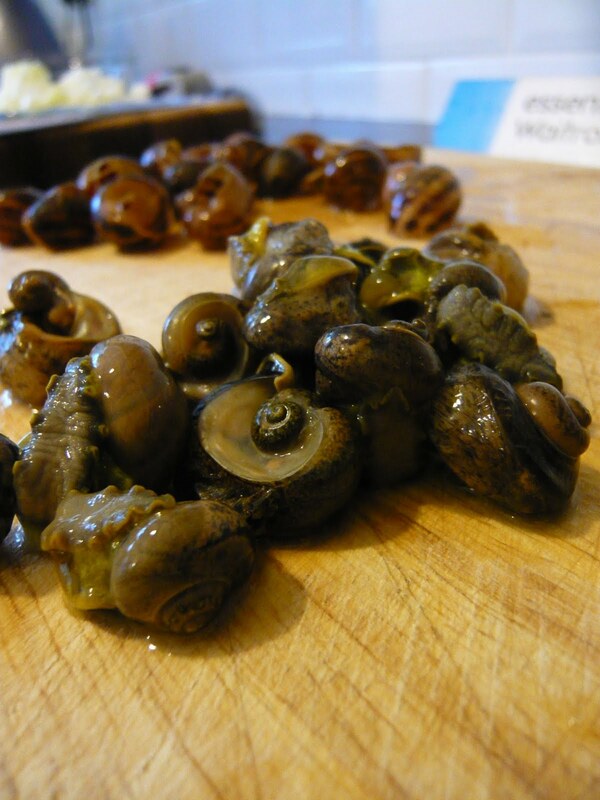 Once you've collected a batch (and how many you collect is up to you but as this may be for experimental purposes, you might want to keep numbers to a minimum first time around) you then have to go about the process of purging the snails. There are various methods, none of them seem hard and fast but essentially you want to make sure that anything nasty that they might have ingested is flushed out. You can achieve this by feeding them fresh green leaves such as spinach thoroughly rinsed in water. Refresh the leaves and clean your tub daily as though you were some kind of chambermaid, lulling the snails into a false sense of security, making them think that they're on some kind of gastropod holiday and thus will be nice and relaxed. After a few days you will notice that they ahem, will start 'pooing' green which means any horrid matter has been flushed through. From then, it's up to you. 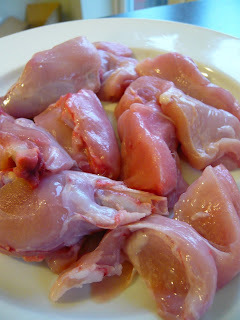 If you are in a rush to eat them, you can put them on a diet of water for a few more days and then once they are 'empty' you can move onto cooking them. Or you can keep them going for a couple of weeks, fattening the Brians up on oats and herbs. For entertainment purposes, you even feed them a highly coloured vegetable such as carrot and marvel as they start to poo orange. I kept my going for about 2 weeks on oats, sage and parsley before putting them on the water diet. Please also note, your snails should be perfectly happy in this state but should one or more expire early into the game then they have probably ingested something really nasty such as pesticides so get rid of the deid ones as soon as possible. 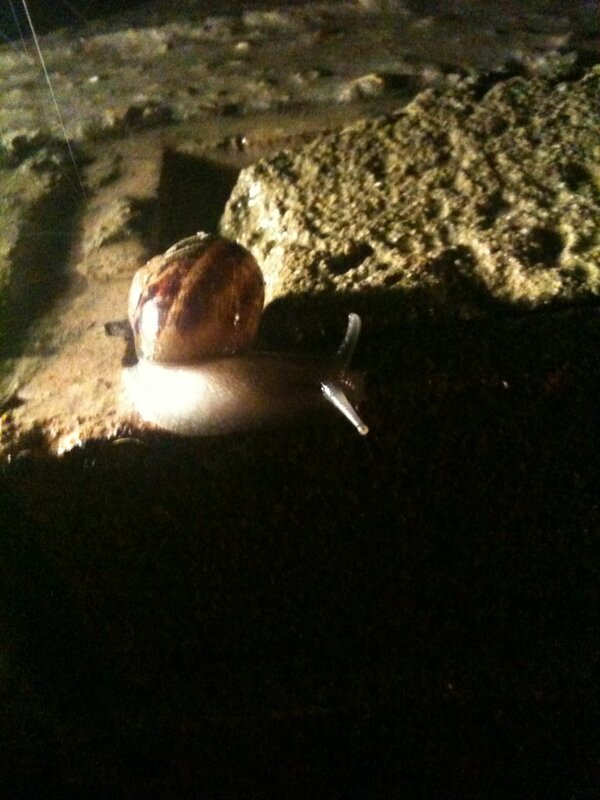 You can tell by scratching the snail's foot, if it twitches it is still alive. When you are ready to eat your Brians (after the 3 days on water only diet), take them from their plush plastic honeymoon suite and rinse them in water, give them a little stroke on the back of their shells and thank them. And then plunge them violently into a pot of boiling water. Don't think about it, just do it. And don't think too much about the boiling water turning a murky putrid colour with foam billowing everywhere. I know I tried not to. 2 or 3 minutes should more than do it. 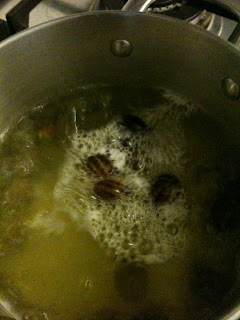 Drain the grubby snail juice away down the sink, I can't think of any use for it really and not many recipes call for snail stock. 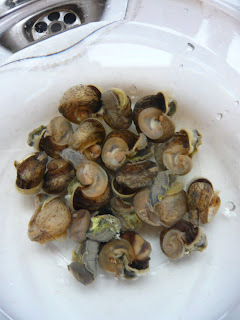 Leave the Brians to cool down and then with a wooden tooth pick or fork prong, pluck the mollusc from out of it's shell. Try not to blanch. Try not think of a child pulling a long large bogie from their left nostril on the playground. Remind yourself that the French and Spanish eat them all the time and Heston Blumenthal makes lovely porridge with them so they must taste nice right? Once you have plucked all the Brians from their protective housing and got over yourself, you now have to remove the small gall sac which is the coiled section that comes out of the shell last. This cuts away quite easily. Put the snail meat into a bowl and put the empty shells to one side, keeping in mind that you may want to save them and make your wife a pretty necklace and earring set for Christmas. Rinse the snails in the bowl further with water and a dash of malt vinegar. I couldn't really see the point of this but I have read that this gets rid of any impurities that might just remain. Like what was the whole point of purging in the first place? But I suppose you can never be too careful. 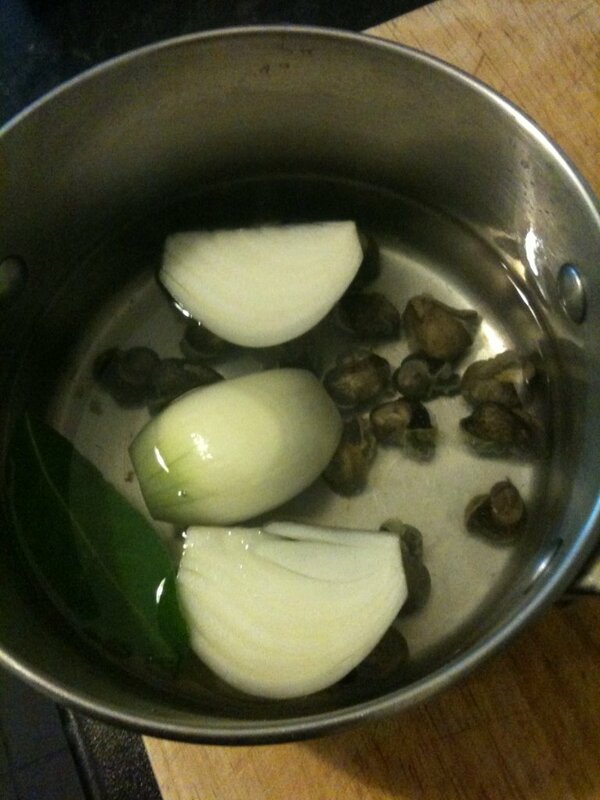 Now it's time to cook your Brians proper in a saucepan of water with an onion halved and a bay leaf. This is where the sophistication comes in so remember to take a sniff of the bay leaf and imagine yourself as some visionary Michelin starred chef before popping it in. Never forget to allow yourself such moments when doing something different. Bring to a boil, simmer for 30 mins, take them off, drain again and then well the world is your oyster (well not quite but it's in the same phylum innit *sniff*). What you do with them after that is up to you. Popping them back into the shell with a hearty dose of garlic butter and a quick baking in the oven might be the immediate answer but there are lots of recipes out there. 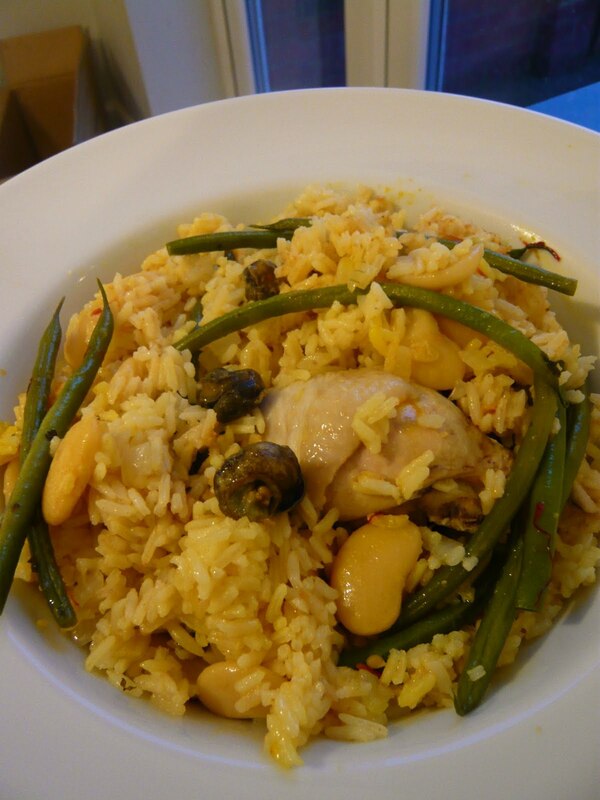 I decided to use my Brians for a traditional Valenician paella with rabbit and chicken. As this is a dish with a rich sense of history, it was developed by peasants in the 19th century using simple ingredients found within the countryside and all that, I thought it would be fitting. And also because Catalan Cooking suggested it to me. The paella was very good, very filling with delicate flavours of saffron running through and I was happy with the rabbit as this was the first time I had ever cooked bunny wunnies, perhaps a little bit dry but still very tasty. But what of the Brians? Were they worth the effort, the heartache, the sorrow, the recapture and further care? Well yes and no. There was something immensely gratifying about the hunter/gather aspect of it all, I always get a kick using an ingredient that I've foraged and in this case having brought the Brians further down the line by feeding them up I suppose I was expecting Manna from the Gods but alas this wasn't the case. 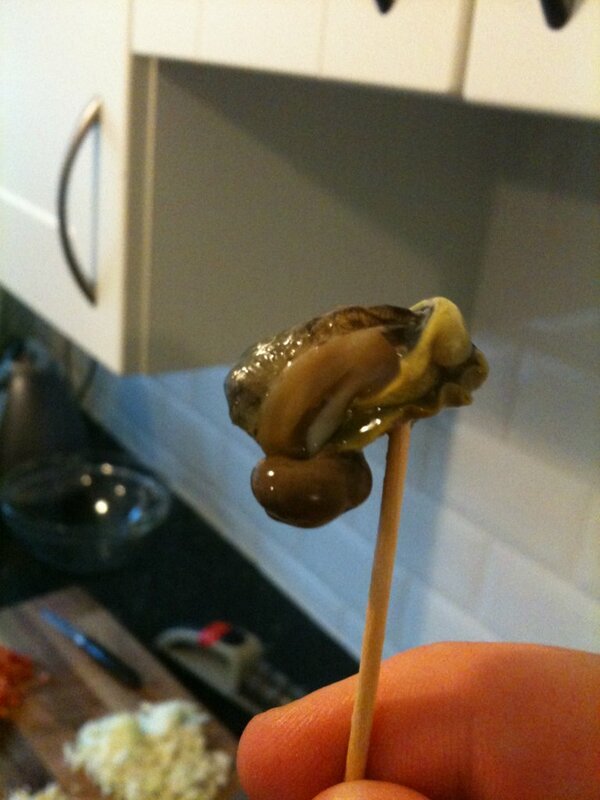 It wasn't so much the texture or flavour of the snail, it was more to do with the lack of it really. All the Brians amounted to were little morsels that slipped down the throat without the merest hint of hello. Given the humble origins of the venerated Valencian paella, I suppose it makes sense, snails were used because they were a free and plentiful source of protein, it didn't matter if they tasted of much. 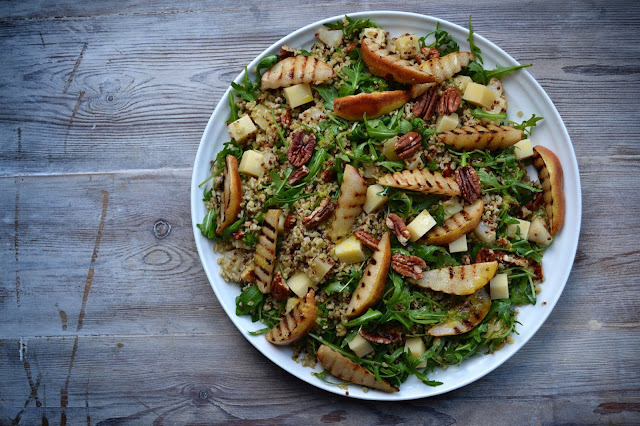 It is also why you'll see recipes for snails which call for strong, rich flavours such the aforementioned garlic butter or red wine sauces and from what I understand, Mr Blumenthal puts a lot of work into that porridge of his. But strangely enough, I would do it again for a dinner party because it is still such an unusual ingredient to use, at least in this country anyway. Whenever I told anyone what I was up to, eyebrows would arch and mouths would drop. That appeals to the show off in me. Now that security issues have been resolved, all I need to do is work out how to beef them up. Hmm I wonder how some Wagu would go down with the next batch of Brians? Total giggle-fest, I love this post. Isn't the entire point of snails that they come with oodles of garlic butter? Next up, pool of Pinchys? 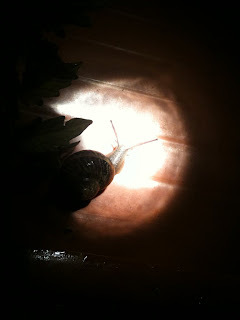 Yay, I thought about harvesting garden snails a few years ago, after a particularly snail-heavy trip to France. But I never got around to it. Hi There food urchin. I have to say, you're a far braver man than I but I do find the whole thing intruiging! I''ve also just started following you on twitter, so if you see any comments from Chillibob23 - dats me! Jenny Eatwell - thank you, I knew that I should never give up, never! Kavey - it was surprisingly easy really and doesn't take up that much time. And plus it was highly educational for the twins. Whitewineandsoda - cheers me dears, want me to send some up? Chillibob - hello sir, I have had a quick goosey gander at your blog and I like the idea. Quite keen to explore foraging further, so I shall keep an eye on what you're up to! Great post. I had no idea it was such a hassle though. I was all ready to head out to my veg garden tonight until I read that I couldn't just blanch and bake with Olive Oil and loads of garlic. I regularly spend hours 'collecting' rabbit and pigeon with my air rifle. They taste awesome...as you know. I also love snails - when I've eaten them in france. 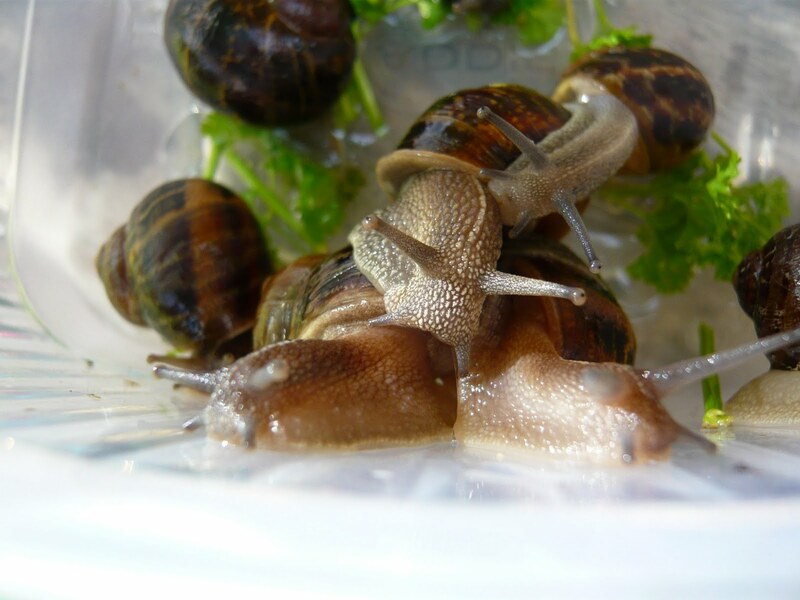 Do all snails need such love and attention or would snails gathered from, say, an organic patch in the middle of the countryside, be edible immediately? You are always up to something in that garden of yours. I'd heard some traditional paellas call for snails, sounds like a good way to use them. I feel inspired to go pick and purge some snails myself now, I live 3 floors up, I hope they won't get vertigo. Great post. Brilliantly entertaining and educational. I've followed your snail exploits avidly. 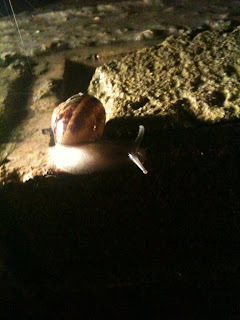 No snails in my garden (live in a desert) but not that tempted to replicate even if there were. I'd rather let someone else cut out the gall. I'll have a new respect when I see snails on the menu! Hilarious. What a great effort. Do hope Ms FU's Christmas jewellery is coming along nicely.